Brand new never used. Purchased about year ago from Henry’s Camera with plans of using it for some landscape and Astrophotography, but never actually got around to using it…has been in the box since. The lens was mounted on my camera (Nikon D810) once right after purchase just to test to make sure it worked, which it did. 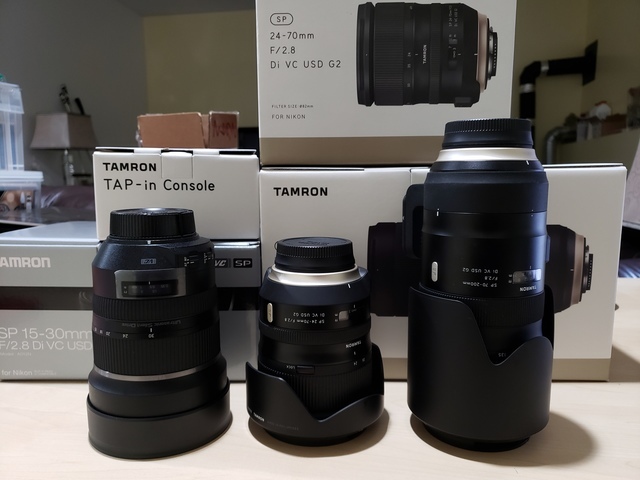 Reviews on this lens are superb and image quality, sharpness and rendering on par if not better than Nikon’s equivalent 14-24 for a about half the price….plus the Tamron has stabilization, which the Nikon doesn't’. Pretty much new, used a couple of times. Purchased about year ago from Henry’s Camera. Reviews on this lens are superb and image quality, sharpness and rendering on par if not better than Nikon’s equivalent 24-70 for a about half/third the price. I have owned the Nikon, the Sigma Art, and this Tamron is my favourite of the three…performance, IQ, size and weight. Pretty much new, used twice. Purchased about year ago from Henry’s Camera. Reviews on this lens are superb and image quality, sharpness and rendering on par if not better than Nikon’s equivalent 70-200 for a about half/third the price. I have owned the Nikon, the Sigma Art, and this Tamron is my favourite of the three…performance, IQ, size and weight.